With St. Patrick's Day this week, green naturally comes to mind. I'm usually the one chastised by my co-workers for not wearing green. Just forgetful, that's all. When it comes to comets, we know that when one starts "greening up," it's a sign that it's getting closer and brighter. 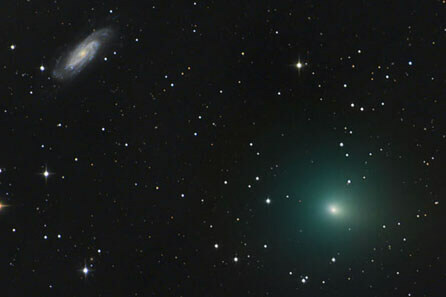 Only two weeks ago, before departing the evening sky, 8th-magnitude Comet 2P/Encke glowed pale emerald in my telescope. I hated to see it go. Comet 41P/Tuttle-Giacobini-Kresak pairs up with the beautiful spiral galaxy NGC 3198 on March 14. Chris Schur. But as often happens, when one astronomical objects departs the scene, another takes its place. This week, periodic comet 41P/Tuttle-Giacobini-Kresak begins the best part of its 2017 apparition, dashing across the circumpolar sky and brightening as it goes. Its timing couldn't be better. It's visible almost the entire night from anywhere in the northern hemisphere, so if you play your Moon-cards right, you can see 41P/T-G-K in dark skies part of every night now through about April 8th. That's more than 3 weeks to catch the comet! And if you're like me, living in a region prone to spring clouds, you'll need it. A week ago, the comet shone at magnitude +9.2 and appeared moderately condensed with a 7′ coma. With a magnification of 64× in my 15-inch telescope, the nuclear region was a bright pip (not quite stellar) at center. Photographs taken a few nights ago hint at a southward coma extension which may be the start of a tail. By March 14-15, the coma had swelled to at least 12′ across but appeared less compact and more diffuse through my scope. Apparently, I was only seeing the core. Other observers using 10x50 binoculars and modest, wide-field instruments are now reporting coma diameter estimates of at least 30′ (Full Moon size) and a magnitude closer to +8. When you attempt 41P, know that its large coma will appear more obvious in a smaller, wide-field instrument than in a larger instrument with a smaller field of view.